Last edited by neonouille on Sun Jan 24, 2010 12:14 pm, edited 2 times in total. Although I know that the footage from the show is in existance, I don't think it's been released in any commercial way. I don't have it, don't know if anyone else has? Theres some nice ones about, pleased to see this thread up and running again. Don't think I have a copy of the Bobby Darren Show, if I have it will be on video somewhere, and I've nothing to play these on anymore. Thanks for reviving this thread, CG! Last edited by neonouille on Sun Jan 24, 2010 12:13 pm, edited 1 time in total. I agree about the strange choice of hair for the Bobby Darin Show, it was sort of a blonde version of the red Am I The Same Girl one! Great to see all of these for the second time around. Nice pics indeed! What's the story of the schoolroom one? Hey Cor nice to see the cutting from one of my files!! Lovely how it was upgraded so to speak Samuel. Meant to say Cor, the story behind the schoolroom one..... it's an Ian Wright photo, the same as the one that Cas won in the raffle and the explanation is taken from his site. 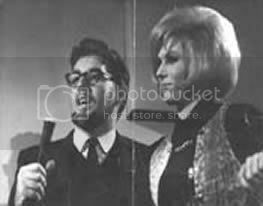 A local paper published a story claiming Dusty Springfield was making £1,000 a week, singing in a Stockton nightclub. At the Redcar grammer School, reporter Mike Hope and I watched spellbound as Dusty proceeded to give the sixth form a lesson in economics. At the end of her chalk scribblings, Dusty detailed how the £1,000 was divided up amongst her band, costumers, managers and entourage, proving beyond a shadow of a doubt that she was left with only a farthing per week, pocket money. Dusty and her twin....and Neil. Always loved that photo Neil! daydreamer wrote: Meant to say Cor, the story behind the schoolroom one..... it's an Ian Wright photo, the same as the one that Cas won in the raffle and the explanation is taken from his site. Impressing that even back then, they stuck to good publishing practice... 'never check a good story'. Good Dusty got the chance to defend herself. That studio shot is the closest to Dusty being undone that I've ever seen! And she's so pretty. She looks rather androgynous to me in that photo! she had so many different looks didnt she and even the most flamboyant ones have a certain something to them. she must have stopped the room every time she walked in. allherfaces wrote: She looks rather androgynous to me in that photo! It's that jacket, isn't it? And the scarf almost looks like a tie. I was thinking the same. Hard to wrap one's head around that despite all these different outfits, it was still the same person inside, isn't it? Not too sure about this one Cor., thought they looked a bit like twins, give or take the beard, not a fave, but there are too many different looks to her aren;t there. this is a funny one Cas, she looks as if shes thinking "this lot are as crazy as a box of frogs"
I don't like that 78 shot at all, I thought that the first time I saw it. I think it's one of the most unflattering I've ever seen of Dusty. For me, she didn't suit flat hair and I think that really she probably knew that herself, but went through a phase of wanting California casual before succumbing to the Elnett again! Guess we have to agree to disagree on that one then. I like your interpretation though, from California casual to the Elnett. Made me chuckle. Just keep 'em coming. We want to see ALL Dusty's faces! Bravo on the Honey mag pic! OMG who does that chick think she is with her hand on Dusty's leg! Oh Mads [from Oz], mah deah, where are you when we need you?! Great to see all of these. I find all of Dustys styles interesting and so vaired. Dusty at Nelson Imperial in the 60s with the managers of the venue. Lucky guys. looks like they can't believe it. a lively pic, they look so dated dont they,I can smell the brylcreem form here where as Dust looks great. Yes agree Liz, Dusty never looks dated , never ever. allherfaces wrote: Oh Mads [from Oz], mah deah, where are you when we need you?! Can I please see that diagram again, Mads? and Paul, Ringo and Tom.. Yes, Dusty, such an icon of the 60s, has a timeless look! Cor, if only I had the energy to try to look that up -- I honestly can't see that picture right--it's like an optical illusion or something. Some good photos again from you all. Great pics once again, at least Princess Margaret got to be introduced here , not like the RAH.farce. love the Tom Jones one didnt like the 2nd one though I dont think she needed to curtsey to Maggie. shes thinking "release those tapes Dammit"
She and Yvonne both seem to be laughing there. Didn't they used to party together before Dusty made that scandalous remark at RAH? 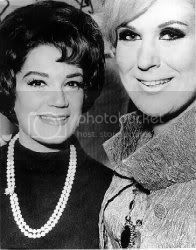 I recognise Connie Francis... and who are the others...? Petula Clark was on the end but Carole will know. Timi Yuro is next to Pet and the other two ladies are called Iva Zanicchi and Audrey. I did know who the guy was but I've forgotten! It'll be hidden on my computer somewhere though and I'll eventually come across it. These are special favs of mine, thanks for posting again Carole. I love this thread! Thanks, everyone, for posting these pics. our lovely PSBs and Dust in lovely purple. I loved this time for her. Have we had this one this time around? this is a lovely one of them Cas.I loved Dusty with this image almost as much as "a girl called Dusty"
Saw this one today as I was going through my files,its part missing off it, comes from re doing all my files a while back. Dusty and Beverly and Shirley of the Shirelles. Pic date August 1968. I don't think it's anything to do with your files Cas, my copy of that picture is just the same. The pic from DWD (with Douggie and Pat), I think surfaced when Pat made a request through the Bulletin for any pics of her Dusty. VW had asked her for one for the book but Pat had hardly anything, but she thought the fans might have. Love that one with the Shirelles. Thanks, Cas. Losing track of all these so hope this one hasn't been posted. Can't see Madeleine in this one Cas. Can't say I know who all these folks are...should I?! The orange wig has changed its owner! Caption! Lulu: "Wonder if I should have a go at 'How high the..... er, hair'?" Another, I hope hasn't been posted this time around. I love this one as Dusty looks really happy. Yes. How cool would it have been if she could have made a comedy film with Rock. Dusty and Elton John again. Thanks, Samuel. It's amazing all the things you dig up. Not to ask a dumb question, but is that Helen Shapriro with Dusty? Thanks for the Dusty and Elton one Samuel, I haven't seen that shot before. She looked so good that night Yes, Nancy it's Helen. What year and what was the occasion? And, the timeless question-- is that her hair or a wig? Finally, is the Bjork's swan costume in the foreground? I think I've been told what the occasion possibly was, but it escapes me, I'll try to remember or chase up the answer again. I've often wondered if that was the night that Elton said they were going somewhere and went into a drugstore for Dusty to buy hairspray......and she used most of the can before they got out the door Real hair definitely, and it looks to be mid 70's but you probably knew that. I'm without voice to the hair of Dusty in the second picture. Some nice ones today, great to see all of these. Thanks everyone. Awesome Shot! with Matt Monroe...never seen this one before! Yes Dusty looks well in the one with Matt doesn't she Josh.